We often talk about the important relationship between small cap CRE and residential housing. Years ago our research showed that small commercial property prices were more highly correlated with home prices than with prices for institutional CRE assets which tend to be more influenced by the ebb and flow of global investment capital. So it's no surprise that we continue to keep a pulse on home prices and their impact on small cap CRE. Of late, home prices have flattened out. While the 20-City Composite of the S&P/Case-Shiller U.S. Home Price Index rose to a 5.7% annual rate of growth - highest in 19 months - it's clear the trend is now more subdued. Home prices were unchanged during January as well as the latest three-month period. And eight of the Index's 20 metros lost ground during January after 10 posted losses in the previous month. Small cap CRE prices have only modestly out-performed according to Boxwood's Small Commercial Price Index for the same 20 markets (SCPI-20). Prices increased by 0.4% in January and just 1.2% over three months. And the 7.0% annualized return, albeit encouraging, is behind last year's pace. The graph nearby shows the recent leveling off in month-over-month prices for both indices. 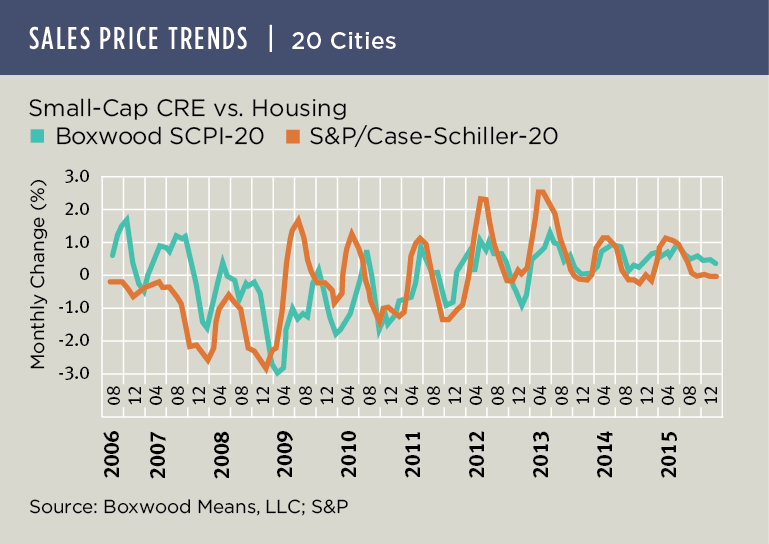 It also illustrates two more trends: one is that the amplitude of seasonal home price swings has strikingly diminished over the past two years; and the other relates to small cap CRE prices. That is, small cap CRE prices historically lagged changes in home prices by roughly six months. As the graph shows, that gap has largely disappeared, and housing and small commercial prices are moving together on a near simultaneous basis. Some housing analysts indicate that pent-up demand and low housing inventories are likely to produce a robust home buying season this spring. If past is prelude, that event will likely have an immediate and positive impact on small cap CRE markets.